There are many drinks out there that you may reach for to quench your thirst. If you choose wisely those drinks may offer more benefits to you, including anti-aging! 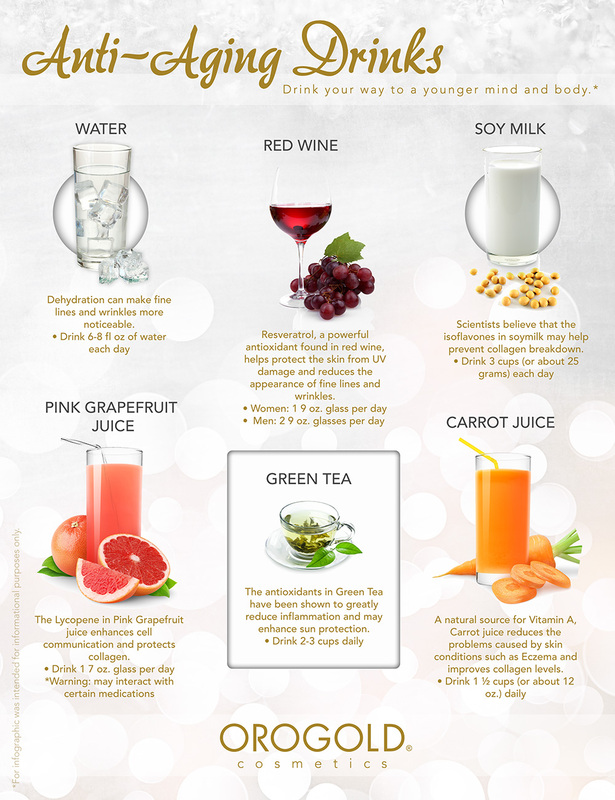 Reach for the beverages in our handy infographic to drink your way to a younger mind and body. The first and most important beverage is water. People really do not drink enough water. You do not need to feel thirsty to drink water, just drink it throughout your day. If you wait until you actually feel thirsty you may already be dehydrated. 6 to 8 fluid ounces of water are recommended per day. If you are active or spend a lot of time in the sun you should drink even more! Juices are also great for better healthy and younger looks. Try carrot or pink grapefruit juice. Pink grapefruit juice contains lycopene which enhances cell communication and protects your body’s supply of collagen. Drink about 7 ounces a day for maximum benefits. Just be aware that pink grapefruit juice may interact with certain medicines, please consult with your doctor if you are any medications. We all know that carrots, and carrot juice, is good for our eyes, but did you know that this natural source of Vitamin A reduces problems caused by skin conditions such as Eczema and improves collagen levels? Drink about 12 ounces a day for a healthy glow. If you love to drink milk or have it with your cereal try using soy milk. About 3 cups a day will provide you with isoflavones to help prevent collagen breakdown. On the other hand, if you like a nice cup of tea with breakfast than grab a mug of green tea. Studies have shown that the antioxidants in green tea reduce inflammation and may even enhance sun protection. Go for 2 – 3 cups a day. Finally, for a nice treat go for a glass of red wine. Resveratrol, a powerful antioxidant found in red win helps protect skin from UV damage and reduces the appearance of aging. But more is not better, you should only indulge in 1, maximum 2 glasses of wine per day. Next time you reach for a beverage to refresh yourself, choose one of our anti-aging drinks to keep body and skin looking and feeling great!